Yep. I’ve said it. Balls out. If I had balls. So ovaries out, I guess. I’m certain that the technique I’m going to talk about today is one of—if not the—key to Egyptian magic. It has no known Egyptian name, but you find it everywhere throughout Egyptian sacred written materials. It freaked out the Greeks when they learned about it from Egypt. It still freaks out some modern magic workers. I am Isis. I have gone forth from my house and my boat is at the mooring rope… O you who travel in the sky, I will row him with you, I will travel as Isis. My name is Isis in the Sealed Place; I am in my name and my name is a god; I will not forget it, this name of mine. I am Isis when she was in Chemmis, and I will listen like him who was deaf and who stared. Go behind me for I am Isis! Cool moonlight streams into the Circle, falls upon the altar, glitters the silver jewelry upon the breast of the High Priestess. Her eyes are closed. Her arms and legs are flung wide—as if she would abandon her body by sheer human desire. She feels her heart radically alive. She breathes softly and deeply, praying in silence for the Goddess to come, to come. Then a sharp intake of breath. The High Priestess’ breathing has become ragged. Moonlight catches in her hair, illuminates her body. An electric thrill runs up her spine. The nape of her neck prickles with spirit fire. Her hair stands on end. Her dark eyes snap open, staring strangely. The atmosphere within the Circle is changed. Every one of us feels it. Excitement in the pit of the stomach. Anticipation. Truth. We have “Drawn Down the Moon.” The woman who was our High Priestess is—for this brief and sacred moment—the Goddess incarnate. And She gives us Her blessings. 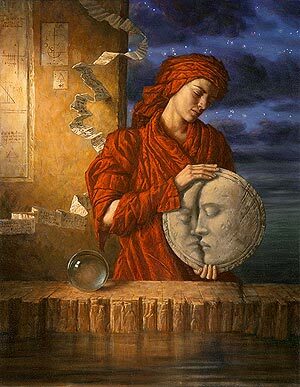 A beautiful modern rendition of Drawing Down the Moon by Jake Baddeley. You can purchase a copy here. The modern Wiccan practice of Drawing Down the Moon comes to us from ancient Greece, when it was a common power practice of the famous Thessalian witches. 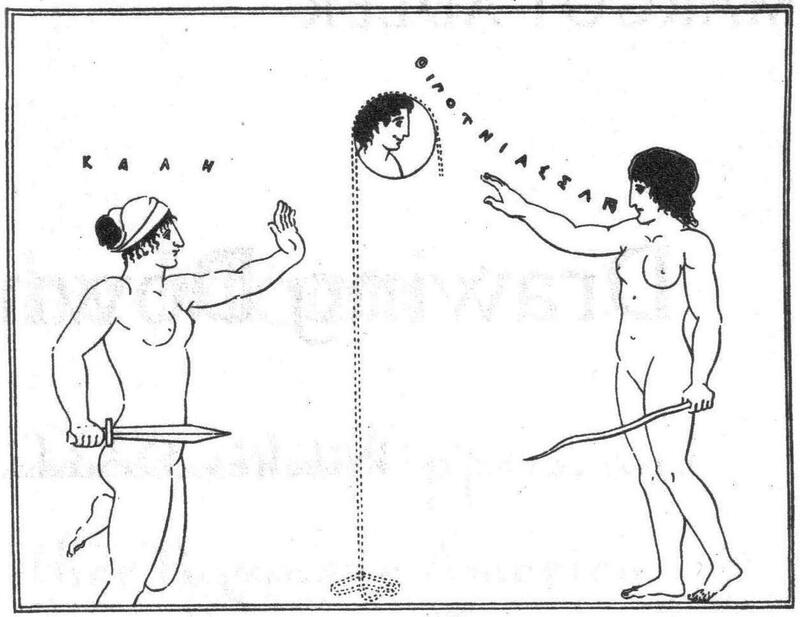 The technique was known in even the highest intellectual circles of Greek and Roman society. Plato mentions it as do Lucan and Horace. Now, the Thessalian witches could have developed the technique themselves, but more than likely, it came to them from that ancient and seemingly eternal font of All Things Magical, Egypt. It’s relatively easy to tell when we are witnessing the technique of Kheperu. Most simply, whenever we find the deceased, the priestess, or the magician claim TO BE a particular Goddess or God and speaks in the first person, we are likely to be witnessing Kheperu. It is the voluntary taking on of the astral or imaginal form of a Deity that enables the ritualist to share, albeit briefly, in the powers and Divine energy of that Deity, usually for the purpose of enhancing the effectiveness of a ritual or for deep communion with that Deity. 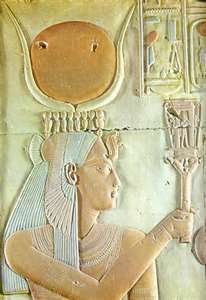 I am in the retinue of Hathor, the most august of the Gods, and She gives me power over my foes who are in the Island of Fire. I have put on the cloak of the Great Lady, and I am the Great Lady. I am not inert, I am not destroyed, and nothing evil will come to pass against me. The deceased “puts on the cloak” of Hathor and becomes Hathor. Doing so enables him to use Her power to protect himself in the Land of the Dead. There is a basic idea that must exist in a culture to make it possible for the idea of Kheperu to develop—and that is that human beings are not divorced from the Divine and that they have the ability to become even closer to the Divine. And indeed, the idea that a human being could be god-like is found throughout Egyptian literature. In the Instruction for Merikare, wisdom literature from the First Intermediate Period, it is said that the deceased is “like a god” in the beyond and refers to humanity as the “likeness of God.” A human being with great knowledge is also said to be a likeness of God. Deities are inherently godlike, but human beings who wish to partake of godlike powers have to make an extra effort—through ritual actions and by being in accordance with Ma’et, “Rightness” or “Truth.” By proper words, deeds, and personal rightness, human beings may participate with the Divine. 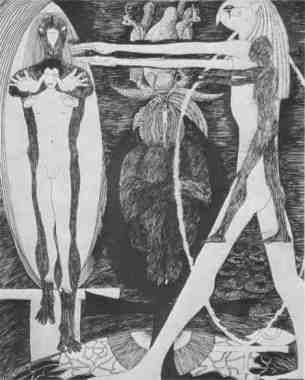 The technique of Kheperu is a defining characteristic of Egyptian and Egyptian-derived magic. There are reasons to believe that it was more than a mere invocatory convention to the Egyptians and that a genuine connection with the Deity invoked was both intended and achieved. Kheperu was one of the key ways the ancient Egyptians empowered their spirituality—and it is one of the most important ways we can empower our own spirituality and our relationship with Isis, today. This post is plenty long for today. So this will be a multi-post topic. Next time, we’ll look at some more background on the technique, then we’ll follow that up with some ways we can use it in our relationship with Isis. * A moderated and drama free FORUM where polytheists can come and share ideas, discuss theology, plan events, share poetry and devotional writing, request help or prayers, barter or sell relevant art/craft/services, make connections, raise funds, and so on. I love the idea of highlighting great writing that’s coming from the broader polytheist community, but I really hope the discussion forum will become the heart of the site and be a place that’s productive, focused, and really works in service to polytheists from all pantheons. I adore synchronicities and feeling in the flow. I was just discussing ‘carrying the Goddess energy’ with someone a few hours ago. I can see why Christians have been so adamant about trying to stomp the practice out while, ironically, admonishing one to ‘be filled with the Holy Spirit.’ It’s powerful stuff. I really enjoy all the illustrations you post with each blog entry. I have been a Jake Baddeley fan for ages.